OSHA has extended the compliance date for specific ancillary requirements of the general industry beryllium standard to Dec. 12, 2018. It affects only provisions for methods of compliance, beryllium work areas, regulated areas, personal protective clothing and equipment, hygiene facilities and practices, housekeeping, communication of hazards, and recordkeeping. Enforcement of new PELs for general industry, construction and shipyards, and the general industry provisions for exposure assessment, respiratory protection, medical surveillance and medical removal are unaffected by this rule. Read the notice. One in ten underground coal miners who have worked in mines for at least 25 years were identified as having black lung, according to a new report by NIOSH. Coal miners in central Appalachia are disproportionately affected with as many as 1 in 5 having evidence of black lung – the highest level recorded in 25 years. Since 2000, the nationwide prevalence of black lung has increased, especially in progressive massive fibrosis (PMF), the most severe form of black lung disease. Read more. The OSHA Safety Pays tool uses your company’s profit margin, the average costs of an injury or illness and an indirect cost multiplier to project the amount of sales you would need to generate to cover those costs. The tool is intended to raise awareness of how occupational injuries and illnesses can impact a company’s profitability, not to provide a detailed analysis of occupational injury and illness costs. A recent editorial piece in ISHN promotes a new approach to safety success. More companies now are engaged in collaborative learning – part of the drive for greater worker engagement – and also a means to improve safety performance. Training, coaching and mentoring will always be important in safety, but team collaboration may offer even greater benefits. Read more. OSHA’s recently updated Avian Influenza page provides information on protecting workers in egg and poultry production, veterinary facilities, pet shops and food services who may be exposed to infectious birds or poultry products. The page includes information on hand hygiene and good housekeeping, as well as recommended precautions, such as PPE, for higher-risk occupations. Visit the avian influenza page. Safe + Sound Week is a nationwide event to raise awareness and understanding of the value of safety and health programs that include management leadership, worker participation and a systematic approach to finding and fixing hazards in workplaces. The official event dates this year are August 13 to 19, but the information and activities can be useful anytime. 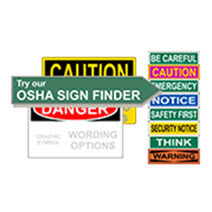 If you need OSHA safety signs with Danger, Caution, Warning, Notice or other headers, you’ll find them fast with the ComplianceSigns.com Sign / Label Finder. Our OSHA safety signs address dozens of topics, including chemical, electrical and industrial hazards. All our OSHA safety signs comply with the OSHA 29 CFR 1910.145 standard for sign color and design.